Bible historiale – Le Premier (-second) volume de la bible en francoiz. Paris: Jean Petit, 24 October 1520. Rare Paris edition of the Bible in French. 314 x 222 mm. With c. 185 woodcuts. This is an exceedingly rare copy of a printed Bible historiale, the most popular version of the Bible in the French vernacular. Richly illustrated and suitable for lay readers, it was frequently published in Paris and Lyon in the first decades of the 16th century, however, only few copies of each edition have survived. Early printed book. Seventh Paris edition of the Bible in French. 314 x 222 mm. – Two volumes bound in one. ff. , 114, 165; ff. , 144, 113. Two titles with large grotesque xylographic initial and publisher’s device. With c. 185 woodcut illustrations. The first complete printed Bible in French was a Bible historiale, originally composed by Guyart de Moulins and based on both Petrus Comestor's Historica scholastica and significant portions of the Latin Vulgate. Guyart's work in form of a history book renders the biblical text more approachable for laypeople. In the 14th century, it was complemented with books from another translation, the Bible du XIIIe siècle, to form a more complete version similar to the Vulgate. 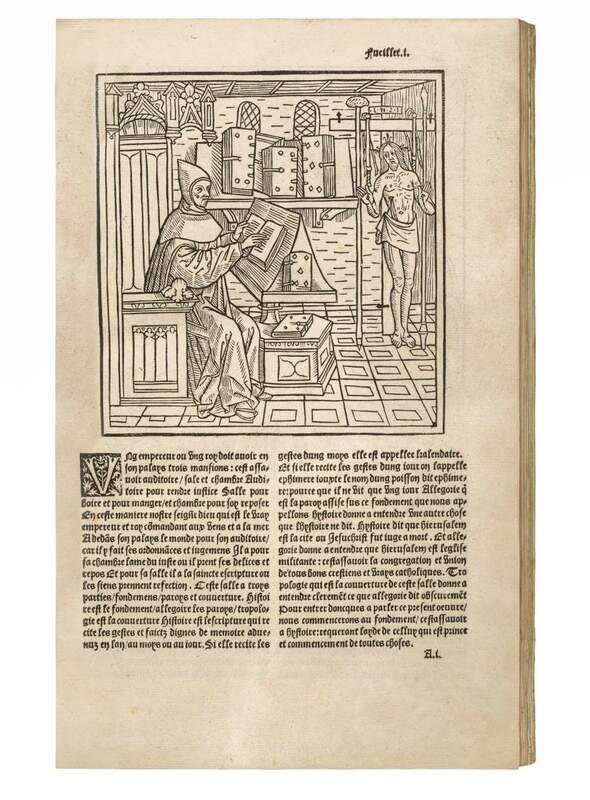 About 1498, the French King Charles VIII commissioned the first printed edition from Antoine Vérard. Representing the Grande Bible historiale completée, it is the only complete translation of the Bible printed in France before Jacques Lefèvre d'Étaples (1530). The book at hand is from a shared edition: the present copy carries the device of the bookseller Jean Petit on the titles and his address in the colophon; the other part of the otherwise identical edition bears the device and address of François Regnault. The present edition is a close reprint of the 1517 edition by Antoine Vérard (or, rather, his son Barthélemy, as Antoine died c. 1514), using most of the same woodcuts for its rich illustration. The woodcuts come from various series in different sizes and styles. Alongside biblical subjects, the book also includes depictions from chivalric romances, the Chroniques de France (1493), the Mer des hystoires (1488), the Biblia pauperum (1504), and even cuts likely acquired from a German workshop. All early French Bibles are extremely rare. While frequently published, most editions survive in less than ten copies in public colletctions. No other copy of any edition between 1505 and 1529 has come to the market in the past forty years.